We’re thrilled to congratulate our Gen2Gen Encore Prize Director Janet Oh, who was just named a 2018 Next Avenue Influencer in Aging! Oh’s work helping to launch the Prize has shined a light on adults 50 and older who are using their time, talents and wisdom to help youth thrive, which you can read more about here. Oh joins a remarkable group of 11 other honorees including researchers, entrepreneurs, thought leaders, groundbreakers and advocates who are helping to transform the cultural narratives around what it means to grow older in the U.S. By recognizing the work of these individuals, Next Avenue hopes to inspire new dialogues and encourage others to innovate around how we can be making the most of our longer lives. 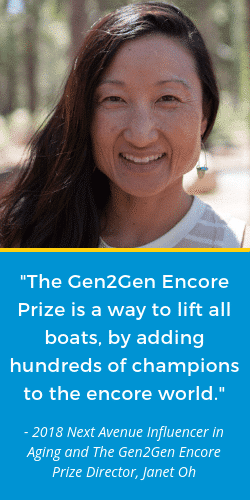 This year’s $100,000 Gen2Gen Encore Prize will encourage innovation and add hundreds of champions to the encore world. As Oh says, with so many forces conspiring to divide us, our 24 semifinalists have come up with new ideas to bring us together. Vote for your favorite innovator here today — and every day — through September 25th and take a small step in investing in our multicultural, multigenerational future!